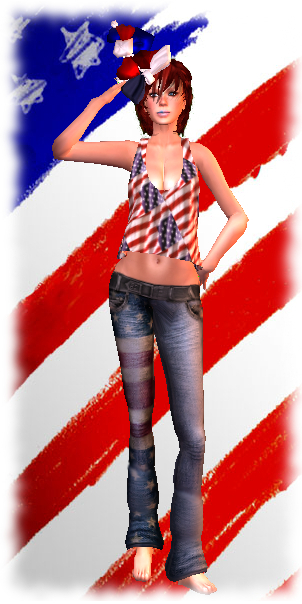 Just My Style: Happy 4th July! And on my travels around the SLuniverse, I managed to pick up some very cute items! These cute jeans are a limited edition 4th July gift by ::Poised:: - I love the flag print on them! The top is mesh, and is the free 4th July gift by !! Twisting Infinity !!. It also comes with a red denim skirt with flag motif and this shape so it fits nicely! Seeing as I was in the mood for the red white n blue....I figured that I could do with some red hair and a nice holiday hat to go with it! 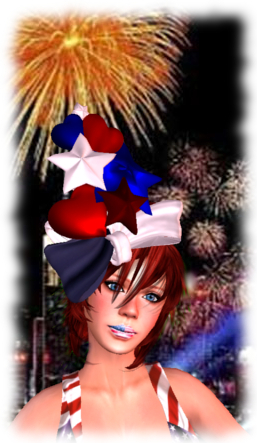 So I hopped on over to *Bliss Couture* and picked up the 4th July free gift, which was this beautiful hat/fascinator! I think you will agree, it's really cute! The hair I found on SL Marketplace. Well when I saw the name of it, of course I had to have it, you'll understand why in a minute when I tell you! It is the Nena hair in Ruby, and has colourable front streaks, by A&A Hair! It's on promo at the moment and is free on the marketplace until 15th July, so grab it whilst you still can!! Now what else did I need to finish off my look....there was something missing and I just could not work out what it was! So I trawled the marketplace for a while, and what did I come across....these gorgeous stars n stripes lips! How cute are they!? They are the American Lips by [::DD::], and cost me 0$L! Best thing about everything I got!? Yep you guessed it, ALL FREE! Free in every sense of the word....!